California Auto Camps: This may be the latest in a crop of quirky camper hotels around the West that have all the romance of the open road with none of the heavy towing. In the heart of town where reasonably priced rooms are rare, these five renovated trailers are enough to make an Airstream convert out of anyone. Each comes with two beach cruisers for touring the coast like a local. Petaluma Metro Hotel: Two Bambi Airstreams sit in the plastic flamingo-filled garden of the French-themed Metro Hotel, about 15 minutes from Sonoma wineries. The aluminum interior has all the amenities of a typical room with morning coffee and pastries, room and maid service, and flat-screens with surround sound. 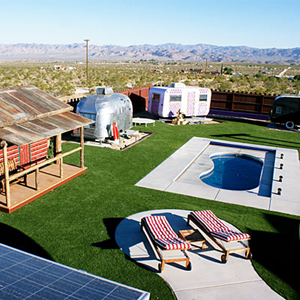 Joshua Tree Trailer Palace: The Hicksville Trailer Palace at Joshua Tree, CA, has eight kitschy trailers, including one with a 1970's theme and electric fireplace. There's also an archery range, pool, and mini golf course opening soon. Landers High Desert Outpost: Kate's Lazy Desert's six vintage trailers, restored by The B-52s' "Love Shack" video backdrop artists, are from another world, one where you live in a lava lamp. Six uniquely-themed vintage trailers serve as your desert home-away-from-home with bright pops of color and whimsical themes. 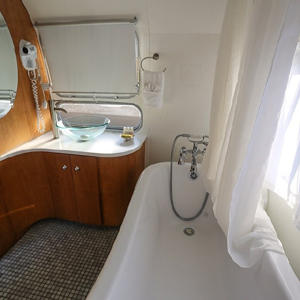 For example, the Bue Stripe Airstream or "Tinkerbell" is 32' has one full bed, a bathroom and small kitchenette. 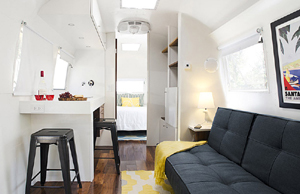 The Orange Stipe Airstream "Planet Air" 30' has one full bed, a bathroom and small kitchenette. They are all air conditioned and each airstream accommodates 2 adults only. You'll also have a hammock, a little BBQ grill, coffee maker, and basic cooking utensils. Experience incredible views, starry nights, and the magical experience of the desert! Even more California Airstream campsites: Click here for 7 more places to stay along the California Coast in an Airstream Trailer. This must be catching on!